Nikiva Dionne may not be a household name just yet, but she certainly is one to watch in Hollywood. The Baltimore native studied fashion in New York where she also began her modeling career before moving to Los Angeles, C.A. where she is currently an actress on a variety of shows. You can see Nikiva recurring in season three of HBO's hit series Insecure as Stacy Sutton an opinionated attorney in a predominately black law firm. And this fall as the powerful, resilient and sexually intriguing Deputy DA Nia Wells on the CBS hit series S.W.A.T. We caught up with Nikiva to get her thoughts on breaking into the very difficult world of Hollywood, following her dreams, creating her app Lyric Party Game and much more. When was the exact moment you knew you wanted to be an actress ? I actually wanted to be an actress as a child but it was written off as a childhood dream. However the moment, I knew acting was my purpose was about 8.5 years ago. I did my first Fast, I read the book The Alchemist and the following Monday when I returned to work, I resigned without giving a 2week notice. I remember being in the stock room bathroom, I use to run a chain of retail stores, on the floor saying 'God if you tell me to do it, I promise I'll listen.' I've been a full time actor ever since. Breaking into Hollywood is so tough, have you had a moment yet where you felt like you made it? Nope, lol. There are several moments where I'll realize “ohh my goodness I am living my dreams, “ . It's humbling when people recognize the work you've done. It's sobering when you realize Monday you can be on a hit show and the following day the show can be canceled. Therefore, for me 'making it' is making every moment count, staying present, staying grateful, working everyday to become a better actress and using my platform for a purpose. To think that someone could look at my work and maybe be inspired to follow their dreams is incredibly rewarding. What's a typical day in your life like ? Uhhh, there is no typical day. Some days you are on set all day, some days you are preparing for an audition or several auditions, others days you have no auditions so you're forcing yourself to get on camera and update your tools so that you maximize the auditions when they come. Other days are my Lyric Party Game days. I developed a party game app for music lovers that I launched in October of last year, so there is no such thing as days off. If I'm not acting or preparing to act, I'm working to make sure more and more people know about Lyric Party Game. Entertainment is super unpredictable, there is no blueprint so you have to be honest with yourself. Identify the things you do well, the things you need to develop and most importantly understand you are your business, if you don't put the time in, to run your business and create systems, you will not have a business to run. Everyday isn't exciting but time is given for preparation, so stay prepared. Being a black woman in any industry is a challenge, but what are some of the biggest obstacles you've faced so far as a black actress? I often say I've always been who I am now becoming and essentially what that means is, I'm finally walking in my fullness. I remember at my last job, before acting, my District Manager told me 'Nikiva sometimes you are too passionate' she was so right, but her thought was incomplete, lol. I was too passionate to be an area manager for a retail chain, but I would need and benefit substantially from the passion I possessed within my purpose. She didn't say all of that, instead she discouraged the very thing that would benefit me. However, it planted a seed, It didn't make me less passionate, it didn't make me try to force her to see my passion as a benefit. My passion was an obstacle because I was operating outside of my purpose, the moment I resigned the obstacle became an opportunity and it worked in my purpose. Listen, everyone does not have an appetite for who/what you are but that does not mean you don't deserve to be on the menu, lol. I realize when I walk into a room some people have already formed their expectations, when I begin speaking some other people form their expectations, but I enter every room, every opportunity with the understanding that there is no one else on the planet that can tell a story the exact way that I can and I owe it to myself to make decisions, have a perspective and be the black woman, I am. Not every role I can play is meant to be mine but I will have no regrets if I consistently tell the stories how I want to tell them, write the stories that I think need to be told, create the games that I want to play, etc. etc. If we focus on obstacles we would miss the opportunities. I am a black woman, from Baltimore, who studied in NY, began her career in L.A. and because I have the audacity to not accept obstacles, I make every experience an opportunity and some days the 'opportunity' is for some casting director to see a black woman as a neurophysis for the first time; and whether I book the job or not, I was that role if even for only 3 minutes in that audition and now the seed is planted. There has been some major breakthrough in Hollywood when it comes to hiring more people of color both in front of and behind the scenes, however there's still a long road ahead. What do you think it will take to make a real change? You know, I met Issa Rae the year I started acting. I'd created a skit series for twitter that 10 people saw lol and Issa was one of those people. I met her in person at a screening soon after and she told me she loved the series. After that Issa and her team held some open auditions and I went and she hired me for a skit she did. One summer she was holding auditions for a pilot and I auditioned and booked the pilot. 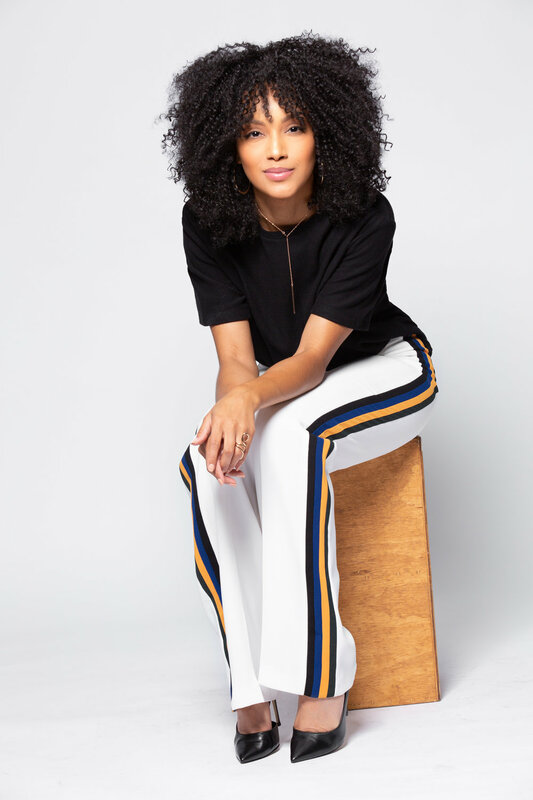 I've worked with Issa several times, including last season on her hit HBO series Insecure and every time she had an opportunity that fit me, I auditioned. I never expected her to 'give' me the role and she never forgot that I was someone whose talent she appreciated and that is an example of what real change looks like. I value that she saw something in me and I will always work super hard to prove I appreciate her identifying my talent. It takes us being like Issa Rae and Ava Duvernay. They are fans of entertainment, they see what they value and they support it, they create platforms for it, they know that seeing the light in someone else doesn't dim their shine, it multiplies their reach. They look at their peers and see their value before it has been validated by mainstream Hollywood. They don't wait until 'you're on' to reach out. Issa didn't call Oprah, she created a series and established an audience and then Oprah called her. I pray my legacy has it's roots in Baltimore but that it inspires someone outside of their comfort zone to obey God's call and go wherever He sends. I pray Lyric Party Game, the shows I'll create and the characters I have and will portray inspires others into their purpose. I pray my legacy is one of audacity, unparalleled work ethic, faith, kindness and humbleness. I use to pray for multiple streams of income, now I pray for multiple streams of impact. I pray my life's work never looks like a photoshopped image on IG, but instead it shows the limitless potential of a mind that decides and says yes to their purpose every day. It's 2019 and the political climate and the harsh realities of the racism that still exist within our nation is discouraging but I pray my life, my legacy reminds someone to focus on what pushes us further and not what's holding us back. Don't ignore the ugly, but don't let it dim your light! SHINE, regardless! Go into dark rooms and cut on the lights, don't sit in darkness, require those around you to shine themselves as well as appreciate your light. That's how we impact the world, we have to shine together, we need each other's light! Learn more about Nikiva Dionne’s work here.